These dolls are for celebrating "Girl's Day" or 雛祭り (hina matsuri): praying for the happiness, prosperity and early marriage of the females in the family. It's traditionally held on the 3rd of March, but the (up to) 7-tier display will be out from some time mid-February until the 4th (any longer is considered bad luck - resulting in a late marriage for the girl/s in the family). They're predictably expensive, as you would have seen just in a department store. Parents and grandparents often pour money into these things - usually building the full seven levels over a period of years, or even generations. Available doll sets range from a simple 1000yen set including just the Emperor and Empress (traditionally the top layer) to the full seven tiers costing significantly more than my car did new. The celebration can be traced back to China more than 1,000 years ago, where is was believed that evil spirits and bad luck could be trapped inside the body of a doll. The dolls would then be sent floating down the river, taking the evil and misfortune away with them. This practice died out when fishermen became increasingly angry at finding dolls in their nets. In modern Japan the dolls are set on a red carpeted platform (段掛 dankake) with one to seven steps. Each tier contains specific elements/dolls, ultimately symbolising the perfect set-up for a noble couple. This tier displays the two imperial dolls, the Emperor, holding a ritual baton, and the Empress, holding a fan. Some displays also include two ceremonial lampshades (雪洞 bonbori) and paper or silk lanterns (火袋 hibukuro). You can also find accessories such as vases of peach branches. This tier holds three court ladies and their sake equipment. A lady holding a long handled sake bearer, one holding a backup sake bearer and the seated sake bearer herself. The musical group, consisting of five male musicians and their instruments: three drummers, a flute player and the singer (holding a 扇子 sensu fan). Two priests: the Minister of the right, depicted as a young man, and the Minister of the left, much older. Mandarin and Sakura trees are often included on this level (mandarin to the right, sakura, or sometimes plum instead, to the right). This holds three helpers, or samurai, who are the protectors of the Emperor and Empress. This contains items of use to the couple inside the palace, such as a chest of drawers, a chest for a kimono and a sewing kit. Oh, for the thrilling life of old. This last level contains items the couple may need outside of their palace. Such as a set of lacquered bento boxes, and an ox-drawn cart. And, as with most Japanese festivals there is a special set menu, called ちらし寿司 (chirashi zushi), which is sushi rice flavoured with sugar, vinegar and topped with sashimi, served with clam soup. Girl's day is celebrated nationwide, although it is said that the Southern island of Kyushu is the best place to see displays and original events. 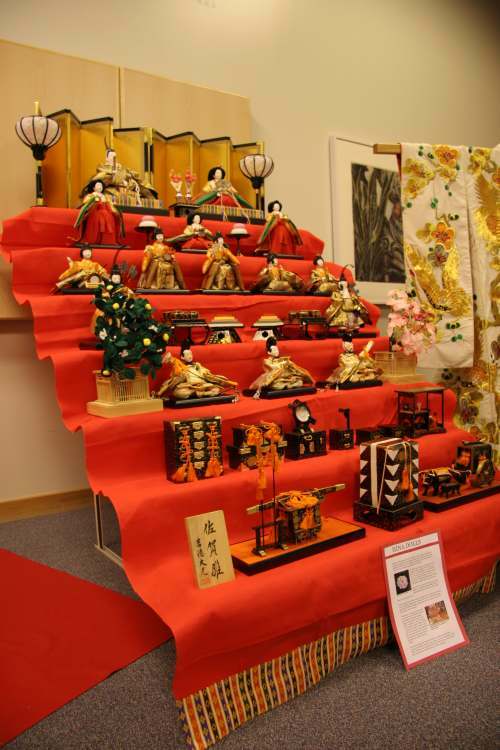 From February until April, 12 cities in Kyushu hold Hina Matsuri events such as re-enacting famous battles and showcasing traditional wears, in addition to beautiful displays of the dolls themselves. Many restaurants also offer a special Hina Gozen menu during this period. Yanagawa Hina Decoration Tour "Sagemon Meguri"
Chikugo-Yoshii Hina Doll Tour "Ohinasama Meguri"
Yame Hina Lantern Festival "Bonbori Matsuri"
List adapted from this tourism website.